Home / Columnists/ Polythene and plastics: The guilt is ours! Polythene and plastics: The guilt is ours! The Government of Sri Lanka has declared a ban and restrictions on the use of plastic bags and lunch sheets, etc. The new regulations are to come into effect from 1 September 2017. The lunch sheet and the bag have been around for a long time and have been subjected to serious scrutiny and perhaps Meethotamulla triggered the final showdown. 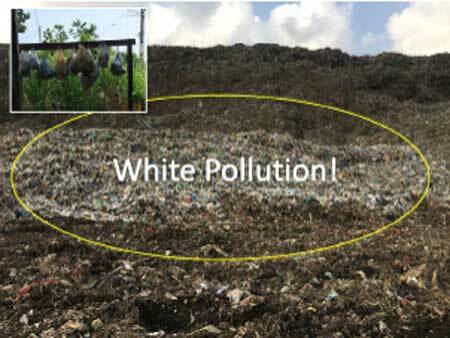 The pictures from Meethotamulla clearly show the impact of white pollution, as plastic pollution has come to be known, and our usual practice of throwing away the collected waste for someone else to manage. Though the weight and volume perhaps is much less there is no question that waste coming from plastic consumption and disposal is the most visible variety and the visual generates our ire. If it is any consolation, this is a common feeling shared across the globe. For an environmentalist it is usually the situation that plastic is his number one enemy. In Sri Lanka we are quite happy in using two terms - polythene and plastics - when in reality they are a single class of material. At the ground level we appear to be more aware of and hate polythene more than plastics and even less so polymers. Polymers are really the class of materials which we should be aware of and yet anger has been directed towards few end products. There is a need to examine this situation – are we guilty of utilising a wrong design and consumption of a wonderful material in a wrong manner and subsequently sitting in unfair judgment of a product. The question is whether we are to blame the material or our behaviour. The title is my answer! Today plastics have carved their way into every part of our lives though we are quite ignorant about it. The start is interesting as well as the journey has been full of innovations. The spread of billiards was creating a significant demand on ivory and the cost to elephants was getting some attention even though this was in the heyday of its growth and perhaps it was difficulties in sourcing rather than the gruesome pictures from ivory hunters that led to the demand for an alternative. When Bakelite heralded the emergence of a new material type as a result of a competition, the world was quick to grasp its use and move on with a yet another material to play with. Elephants too were spared from contributing to our pleasure. Bakelite was the first synthetic polymer and was well received as its versatility was demonstrated in many ways. Many other polymer types were to follow, with nylon being another, which captured the imagination at an early stage. However, it is interesting to see how man’s quest for new functionalities and his search for solutions to emerging problems have led to new materials, and polymers certainly are a perfect example of this. The age of polymers dawned on us and polymers have significantly helped human society to advance. Some are quite quick to point out the versatility of the material and the myriad ways in which the material in its many forms has contributed to society. 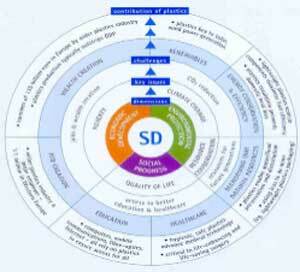 It is interesting to see plastic’s contribution to sustainable development. Plastic played a major role in ensuring a lower cost of food to the consumer in societies such as the United States. The reduction in the per capita cost of food principally achieved through the variety of packaging made available by plastic enabled individuals to have more disposable income and then afforded many options to individuals with a decent disposable income. We wait with bated breath to count the visitors to Sri Lanka as they have the disposable income available to travel and see the world. We just do not engage in that pursuit as a majority as nearly 60% is spent on food whereas in the US the percentage is 13%. 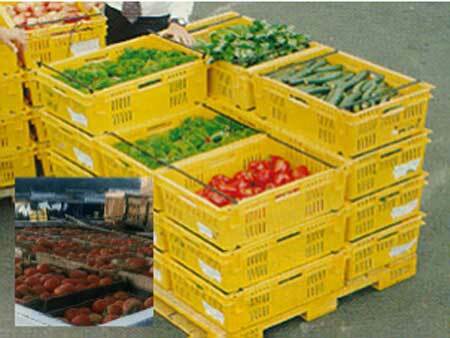 It is perhaps important to understand that we have failed badly in introducing plastic crates to support post-harvest logistics and the opposition was painful to watch. We thus still enjoy significant post-harvest losses and every time I observe tomatoes in wooden crates, with a significant number of nails holding the crate, I cringe with pain from the empathy I feel for the sensitive tomato. It is sad that many people who reject moving garbage from Colombo forget that much of the garbage generated in Colombo is also constituted of these 40-50% losses stemming from fruits and vegetables reaching Colombo in gunny bags, etc. from Dambulla, Embilipitiya, etc. While we can observe plastic wrapping around individual Granny Smiths from the UK, the local banana among others usually gets exposed to all sorts of abuse in transit. It is not quite uncommon to see the crew of the vehicle sleeping atop such gunny bags full of delicate food products and the nation’s agony from losses continues. PVC, which was invented in 1872 subsequent to the introduction of additives such as plasticisers, has found itself thousands of uses. However, it must be added that some of these additives have soured overall acceptance as there is significant concern over chemical additives such as Phthalates, which are associated with migration risk to contents especially with food packaging. The polymers, apart from the services rendered through common services, have come out in unique areas too. The advent of Kevlar has replaced helmets, steel cords in radials and is a polymer which has surpassed steel in strength. We cannot simply ignore the polymer’s contributions to photography and cinema – celluloid! “I just want to say one word to you. Just one word. Plastics.” It is the scene from The Graduate that many Chemical Engineers would remember. In the movie it underlined the big business opportunity. With all these advantages and unique abilities what is the issue? With simple packaging and products like lunch sheets one has to understand we basically are using a material that can last for a long time without decay for a single use function – we use it once and throw away around 30 million bags and sheets per day. Something that can last so long being deployed for a single use appears to be a bad decision in design and that is the heart of the issue. Used once but lasts forever provides the nail in the coffin in the judgment trial on the product. A product created by us for our convenience has a significant shortcoming with that intended purpose which is amply aggravated when our haphazard disposal practice is factored in. The poor material with superior properties in the end has to pay for our short-sightedness in design and in reckless disposal attitudes. This is mostly shown in the marine environment but, with elephants eating plastic at garbage dumps, has been demonstrated on our lands too. It is indeed sad to see an international rating – which is today contested yet still has not been rescinded – that appeared in the prestigious journal Science placing Sri Lanka sixth globally among countries that discharge plastic waste to the marine environment. From nano and micro and plastic debris to multiple plastic gyres in many oceans, our casual disposal has spawned problems of the highest magnitude. The large-scale poisoning of seas cannot be taken lightly. The ubiquitous presence and the ability to sustain the functionalities in an era of demand for sustainability under climate change means that we need to find these materials differently. Traditional polymers came from the petrochemical industry with crude oil primarily the raw material. When crude oil yielded fuels, the process also gave other side streams and these, like naphtha, became a major raw material for the chemical industry. Polymers were among one product and you can also find pharmaceuticals as well. However, with the threat of depleting oil resources, people have turned to seeking renewable materials as source material for polymers and the race is on for bio plastics from bio refineries. It has been demonstrated even at the time of Henry Ford that this is possible but cheap oil replaced such innovations of biological origin. However, in realising this age of biodegradable polymers, we in Sri Lanka may have to enhance our scale-up abilities as a matter of national priority. We have sat in judgment and declared plastics guilty. Look in the mirror and think. We have turned a useful servant into a monster through our actions. Come a disaster, I cannot think of a better carrier for water than a plastic bottle. Even technology to instantly purify dirty water to a potable quality may require a plastic bottle as the force to filter is given by the process of squeezing and I cannot think of another material for that. Again we have to acknowledge that the lunch sheet has an extremely bad product design. More than 20 million lunch sheets per day are discarded across the country and how this can cause problems is not difficult to understand. With poor recyclability, some have resorted to using these as fuel in kitchen stoves and such practices are much more hazardous. Emerging regulations have banned such practices too along with backyard burnings. Let us understand the beneficial properties. However, our behaviour has negated this potential and a couple of designs need to depart from our use. The molecules of our creativity can relax with the thought that it is not their fault but as we do not have the strength to remonstrate with our guilt we take refuge in judging something which just cannot defend itself! The decision of the State should stand while we can write an epilogue with gratitude over the last bag and lunch sheet!